Read an introduction to the topic of Ancient Architecture in the context of this resource. Explore a number of ancient architectural spaces using QuickTime technology. Fully experience an architectural space with QuickTime panoramas mapped to a plan. Visit a specialized project designed to support and enhance undergraduate education. Select one one of the links above for more information. During the fifth century BCE, the architecture of ancient Greece achieved an unprecedented level of accomplishment in the buildings on the Acropolis in Athens. The Parthenon, dedicated to the goddess Athena, was one of the most famous buildings in the ancient world and today remains an essential subject for the study of Classical Greek art and architecture. Built during the administration of Pericles following the Athenian's victory over the Persians, the temple was the principal site of worship and civic ceremony expressed in the Panathenaic Procession. 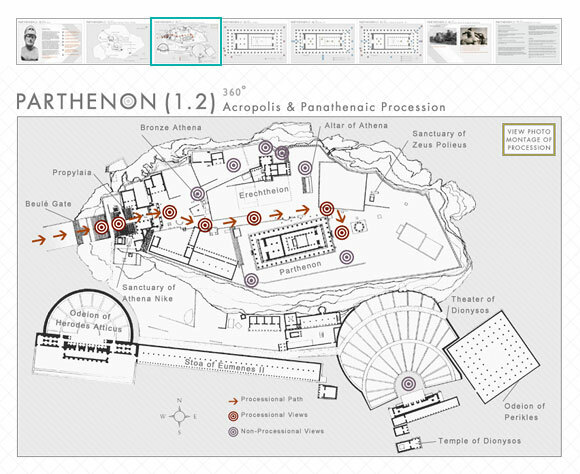 The Parthenon is probably the most carefully surveyed and measured building surviving from the ancient world providing a substantial base of data for modern architectural historians. Structurally, the building depends on the post-and-lintel method of construction. The base measures some 225 feet in length and 100 feet in width, and the columns, designed in the Doric Order, reach a height of 34 feet. The names of the architects, Iktinos and Kallikrates, have been preserved, and the rich sculptural decoration was supervised by Phidias. The sculptural program included a frieze narrating the Panathenaic Procession, metopes depicting the battle between the Lapiths and Centaurs, and, in the pediments, the Contest Between Athena and Poseidon (west) and the Birth of Athena (east). The architecture of Classical Greece became a cornerstone of later developments in the history of architecture, from the Roman Empire through the twentieth century. As an object of both imitation and inspiration, the Parthenon epitomizes the ideals of its creators, and a model for modern students and scholars. Buidling: Sanctuary of Demeter Malophoros. 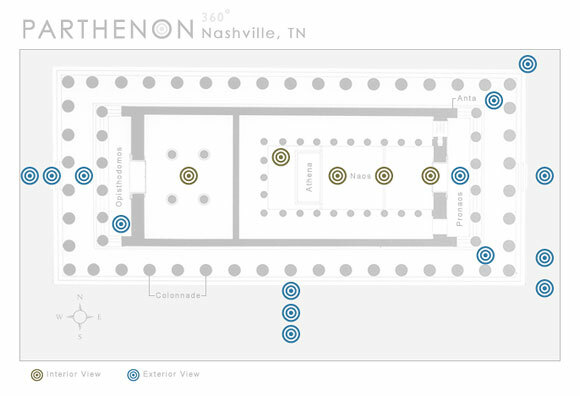 Experience the Nashville Parthenon 360° Interactive Plan. Go there. Experience the Acropolis 360° Web site. Go there.